Just wanted to share a short post on an awesome event coming up on June 1st. 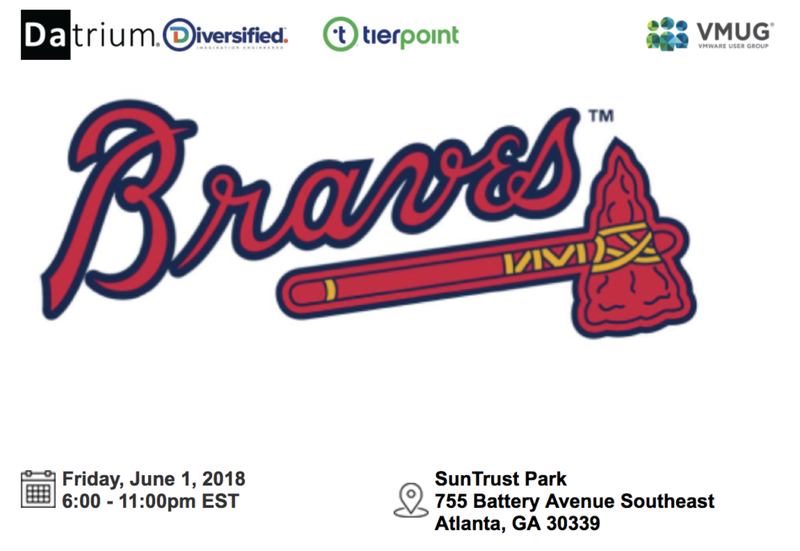 I will speaking at the next Atlanta VMUG in Suntrust Park. We rented out an awesome location to share, eat and watch the Atlanta Braves take on the Washington Nationals. I'm still working on my notes for the event, but I will sharing an overview of Datrium and how Blockchain, IoT and VMware vSphere intersects with Datrium's Distributed Log Structured filesystem. We are working with our close friends at Diversified, and TierPoint and so seating is extremely limited. We are expecting a very large turn out, so register early to get a seat and a ticket. In today’s modern datacenters and hybrid cloud deployments a new breed of data efficiency is required. As organizations scale their storage architecture it becomes imperative to take advantage of economies of more and more data as it enters into one’s data lake. Not only is it important to monitor the rising egress costs but also the amount active data for consistent performance even during ingest. In this next post of my series I will look at Datrium’s Global Deduplication technology and the power it brings to the infrastructure stack to handle data growth while achieving data efficiency at the same time. It’s now table stakes to have localized deduplication in storage architectures, however if customers want to go to the next level of efficiency then Global Deduplication is required to compete in a multi-cloud world. Datrium decided early on to build an architecture that was built on Global Deduplication as the foundation for data integrity and efficiency. It’s with this framework that customers can have assurance for their data, while not compromising on performance and stability for their applications. You may be asking, with all this Global Deduplication talk, what can I expect in regard to my own data efficiency. Well, every customer and data set can be different, however looking at our call home data, we average 4.5x data reduction across our customer base. We anticipate this even going higher when our new Cloud DVX service becomes more widely used. Within the Datrium DVX dashboard UI, a customer can look at the Global Deduplication ratios and also compare that with what data reductions they are getting on a per host basis on flash. As new data is received in RAM on each DVX enabled host, we fingerprint each block inline for local deduplication on the flash in addition to compression and encryption. Then as we write new blocks to the Datrium data node for persistence, DVX will do the Global part of the deduplication by analyzing all data from all hosts, no matter if the data originated from Linux, ESXi, Docker, etc.… we will automatically compare all data blocks. In the small lab example above, we are getting 3.9x efficiency with Global Deduplication and Compression. Keep in mind as your DVX cluster continues to get larger and wider on a single site or multi-site the amount of referenceable data increases which further provides great duplicated efficiency. Let’s now look at some additional points on what makes Datrium’s Global Deduplication technology so powerful for organizations. • Built-in to the new Datrium Cloud DVX fully managed service, is a completely multi-site and cloud aware solution. Datrium fingerprints all data with a crypto-hash on ingest. Let’s say for example you have two sites – primary and DR and also an archive on AWS. When data needs to be moved between sites, first the DVX software exchanges fingerprints to figure out what data needs to be copied to the remote sites. Then, only unique data is sent over to the remote sites. This automatically provides WAN optimization and a decrease in RTO’s. This result is a dramatic savings especially on cloud egress costs. • Always-On Global Deduplication. Datrium provides the software intelligence to handle all data types and workloads providing data efficiency locally and globally without having to determine whether dedupe should be on or turned off for a particular workload. • Datrium can seed remote sites automatically and also use existing data sets for metadata exchange for optimized replication. As an example, current DR environments no longer have to worry about pre-seeding and can instantly take advantage of Datrium’s Global Deduplication for replication savings. • Datrium Cloud DVX can use multiple sites for replication to the cloud for backup/archival. In such a use case, deduplication of the data in the cloud is truly global, where all the data across all the sites is globally deduplicated when data is stored in Amazon S3. • Datrium does not need to send any full’s (VM's or Files) over the wire on a periodic basis. It’s an always forever incremental process, since we always compare with what has already been sent or received from other sites, we never send a full again, it's always incremental to what's already there. Most solutions only look at duplication from an at-target perspective or only localized fingerprints. It’s nice to see that Datrium took the extra time to put together an always-on solution that provides, local, global and over the wire deduplication. In part 1 of the Datrium Architecture series I discussed how a split architecture opens up a huge amount of flexibility into modern datacenter designs. In part 2 of this blog series, I will be talking about an industry first feature that everyone concerned with security in their datacenter will want to take notice. Sure, there are products in the market that provide encryption for data at rest in a storage platform, but there are no converged products as of today that provide government grade (FIPS 140-2) data encryption end-to-end. Organizations must look for a solution that is FIPS 140-2 validated, not FIPS 140-2 certified. Validation is when NIST evaluated the encryption scheme. However, certified is technically meaningless and is mostly marketing, it may be done in the spirit of NIST's requirements, but it hasn't been validated. It's only with the Datrium DVX software platform, that all I/O from an application/workload perspective is encrypted upon creation using AES-XTS-256 crypto algorithm and is a validated solution for FIPS 140-2 compliance. Using the underutilized AES-NI chipset built into modern day microprocessors, Datrium will encrypt data in-use and on access in RAM & Flash and in-flight when the second "write" is synchronously sent to the data node for block durability. This means you will have your data encrypted while in-use, in-flight and at rest, so that there is no risk for compromise at any level in the I/O stack. There is also no need to have SED's (Self-Encrypting Drives), this implementation is software based and is included at no added cost to the customer. The amount of savings this brings to customers is huge, since SED's are exorbitant upon procurement and on top of that you can't mix differing disk types in most systems today. It then becomes an all or nothing implementation when only using a data-at-rest encryption method based only on the drives. There are many use cases for Datrium's blanket encryption. The obvious ones are…. 1) Drive or part replacement. 2) Prevent network sniffing of I/O traffic. 3) Rogue processes that tap into host memory. 5) HIPPA & SLA compliance. Today, Datrium uses an internal key management system for easy setup and management. With this, we support password rotation, startup locked and unlocked modes and in full disclosure, you can also be assured that encryption keys are not stored in swap or in the core dump of the Datrium system. Another cool feature is the shipping mode option, where the key is not stored persistently anywhere in the platform. So, during transport of the DVX platform there is no risk of a data breach during transit. When the system is powered up in this locked mode, the administrator must provide the encryption password before the system will serve any data again. Enabling encryption is extremely easy to do on any Datrium DVX system. Just issue the command: "datastore encryption set --fips-mode validated" this will enable the FIPS 140-2 validated mode for your data. In order to verify just issue the show command: "Datastore encryption show"
You can also verify in the DVX dashboard under durable capacity, where the green shield is. This will show that encryption is enabled with FIPS 140-2 compliance. Now some may ask but wait doesn't this mean if I enable encryption on Datrium that data reduction like dedupe and compression go away. Remember Datrium implemented an always-on system when it comes to data reduction. In so doing, Datrium became the first in a converged platform offering FIPS 140-2 validation without sacrificing data reduction using compression, dedupe or erasure coding. I'm blown away that Datrium has not only done the right thing when it comes to offering FIPS 14-2 validation out of the gate but also without a sacrificing performance nor any data reduction technology that customers love us for. My next post in this series will about Datrium's Global Data efficiency. Since coming to Datrium over a month ago, I have been amazed at the level of talent and product feature advancement that has been orchestrated in such a short time. This has kick started me to write a series of blog posts (in no particular order) on why the Datrium architecture makes so much sense for the modern datacenter. I will be discussing key differentiators and features that make up some of my favorite parts of the Datrium DVX software platform. One of the benefits of open convergence, is that you are no longer tied to the traditional two controller storage system, where scale is solely based on available storage and network resources. Datrium’s flexibility goes even beyond the traditional HCI stack, (where compute and data operations share resources in the same appliance). By decoupling performance and data services from capacity a whole new world of possibilities is introduced in the separation of compute and data storage. 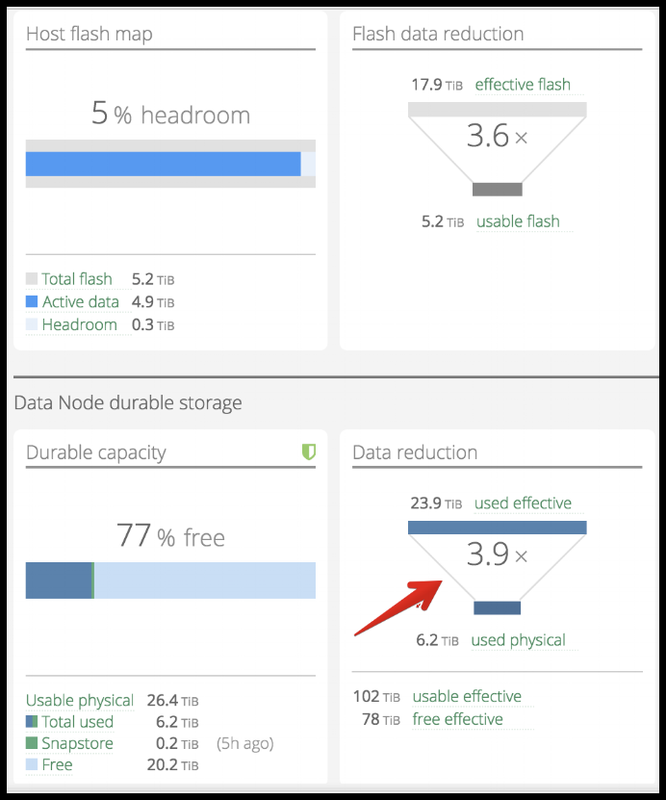 • Use commodity-based Flash resources in the host/server where it’s less expensive and more flexible for I/O processing. • Use your own x86 hosts/servers with ESXi, RHV, or Docker as a platform of choice and flexibility for growth. • Upgrade performance easily with the latest and greatest flash technology in the hosts/servers. • Lower East/West chatter and remove the vast majority of storage traffic from the network where continued scale can be realized and application performance isolation provides true data locality. • Scale Compute and Storage truly independently. • Take advantage of under-utilized CPU Cores for IO processing and data services (Compression, Dedupe, Erasure Coding, Encryption) on your hosts/servers. • Utilize stateless hosts while still achieving data integrity, fault and performance isolation between compute and data. No quorum needed, minimum host/servers needed is only one. • Get Secondary Storage in the same platform for a lower TCO. • Use multiple based storage controllers by virtue of every host/server introduced into the DVX platform. One example of these benefits in a split architecture is realized when disks die or disk (bitrot or Latent sector) errors occur on a primary or secondary storage system. A rebuild (system) operation is the process that is needed for any data system to be in an healthy fault tolerant state again. Every storage system needs to have a process to rebuild data when data corruption occurs, however, there can be side effects when rebuilds are needed. One of the most common consequences with any rebuild operation is the resource utilization needed to complete successfully. During such an operation, your primary workloads could be slowed and hampered with higher latency. Data rebuilds will result in lower performance, and the time to finish the rebuild can be lengthy depending on resource availability, architecture and how much data is resident for a completed healthy state again. Another common storage operation is the rebalancing of data when additional capacity or nodes are added to a storage system. Proper rebalancing tasks can drain system resources based on the amount of data that needs to be rebalanced. This sometimes-timely task is important to keep the pool of data available and avoid hot spots from occurring. Datrium’s architecture is based on a Distributed Log Structure Filesystem. This filesystem provides a platform where workloads are not hindered from decreased performance during rebuilds or other system operations. The decoupling of performance and data services from capacity has given customers the freedom to finally realize the benefits of true cloud like experience right in their own datacenter. (More on this in a future post) By moving I/O operations to the hosts and keeping data at rest in what we call a data node, we achieve the best I/O latency for applications while keeping data safe and resilient on durable/secondary storage. So, when problems or systems operations occur on durable storage, our intelligent DVX software utilizes underused CPU cores on the hosts for these operations while not stealing any CPU resources from running workloads. You can think of your hosts/servers each as a separate storage controller all working together to facilitate storage operations and system processes. As one adds more hosts/nodes to the DVX system, the faster rebuild and/or rebalance operations ensue. During reconstruction of data, multiple hosts/servers can help with system operations. No host to host communication is needed. Each host has its own task and operation to facilitate a faster more efficient rebuild/rebalance on the Datrium data nodes. One very cool example of the intelligence in the DVX software is the built-in QOS during a rebuild operation on the data node(s). This is based on the amount of failures or number disks to rebuild. For example, if only one disk fails then less resources from the hosts are needed for the rebuild operation. This is a dynamic process to facilitate the amount of urgency needed for small or larger failures and errors. Datrium took the best of traditional 3-tier and HCI architectures into a modern world where performance and system operations are in disagreement. A customer can now utilize open convergence to achieve the performance they never had on-premises and will never get in the cloud. Think of it as future proofing your datacenter for years to come. In part two I will discuss Datrium’s Encryption uniqueness and powerful encryption capabilities. For those that didn’t get a chance to watch the vBrownBag Build Day at Datrium last week, the recording is now available on Youtube. The vBrownBag crew did a very professional job and our very own Devin Hamilton delivered a stellar performance! If you are on holiday this week, you won't be disappointed if you spend some time and watch this 3hr video, intermixed with some great interviews and technical discussions. Just released are additional video’s that cover more deep-dive technical discussions from one of engineers and co-founder. I found them to be very interesting and thought provoking. Boris talks about the life of a Datrium DVX I/O while Lakshmi demonstrates the probability of failures in storage systems and how Datrium architects it's system for data resiliency. Enjoy! It’s with ebullience that I’m joining Datrium as their new Principal Systems Engineer. I’m a firm believer in God leading me to new endeavors and this is no different. He has led me undoubtedly throughout my life and so I know there is great things in store in this new opportunity. As some of you already know, it’s rare when an awe-inspiring company culture comes together with great technology! It’s with this combination of greatness that I look forward in exemplifying and also demonstrating how Datrium’s DVX platform can solve real business problems in the enterprise. There are so many exciting things to share about Datrium, so stay tuned!! For those that are unfamiliar with Datrium the company, here is a quick snapshot. • Brian Biles, ex Data Domain founder / VP Product Mgmt. Datrium offers a new take on modern convergence called Open Converged Infrastructure. The (DVX) platform supports VMware, Linux KVM and bare metal Docker with host based flash and appliance based durable storage for cost-optimized secondary storage and archive to cloud capabilities. I have never seen so many women in attendance at a IT convention, not saying I have been to all of them, but I was encouraged to see so many women participating and attending infrastructure, virtualization, and cloud native sessions. Yes, we still had long restroom lines, but it was clear we weren’t alone. I don’t know the percentages, but I wouldn’t be surprised to see that at least 10% of the attendees were women! I find this extremely encouraging as this industry definitely needs a better balance! With 23k plus at Ignite, it was noticeable that the new Microsoft (under Satya Nadella) has some new faces under the cloud native umbrella. It was also evident that a lot of the old faces of Microsoft’s yester-year were present. Microsoft knows that it has a lot to do to convince and educate those that are resistant or reluctant to change. For example, there were a few sessions that were geared to organizational change and digital transformation to the cloud. Not only were the sessions introductory, but educational in hopes to ease fears of the public cloud. Since Microsoft has such a wide base of traditional applications and is deeply engrained into on-premises infrastructures, this obviously creates a unique challenge but also provides an opportunity for Microsoft in the new era of cloud. Introducing the opportunity: Azure Stack. I believe Azure Stack has the potential to not only put Microsoft on top of cloud revenues but change the competitive direction of AWS and GCP. However, with a longer than planned delays and/or technical missteps Microsoft could leave enough room and time for competitive challengers to enter this new product category. Stay tuned for my next post on the Azure Stack architecture, and why I think this new product could accelerate the move to cloud native applications. There are some exciting and noteworthy architectural features that I think will surprise you! Great job Microsoft on a well organized event this year? I'm looking forward to attending next year in Orlando, FL. I recently had the privilege to talk with Forrest Browning, Co-Founder of StacksWare. He is part of an 8-person San Francisco startup that set out to create a software solution that provides real-time application inventorying and metering. As Stanford students in 2014 they were required to do a senior project, which led them to work with VMware's Sanjay Poonen. Sanjay helped them get their start and through work with internal VMware engineers and customer interviews they created in early 2015 StacksWare. The current focus is on VDI, but the software will also inventory and report on server based applications. One could think about StacksWare as a vCenter for Apps where correlations can be made between User, VM, and Host. With best of breed investors, Greylock and Lightspeed, along with advisement from the famous Jerry Chen, this team has a great story and potential. I decided to test it out and see what use cases could come to mind. The very first thing I noticed was how easy it was to setup. All that is needed is their Ubuntu OVA where they have a docker image running. The OVA provides the mechanism to stream inventory related data to a secure SaaS portal. It’s also interesting to take note that since StacksWare is using Docker, all updates and/or upgrades happen seamlessly without user interaction, a nice plus! After powering on the Ubuntu VM, the StacksWare team will provide you an account where you associate your SaaS portal with the Ubuntu VM. Upon login for the first time, a connection must be made to vCenter and Active Directory. The next step is to decide which application collection method to use. The beauty of this is that you can decide whether to use agentless or have a managed agent installed automatically by StacksWare. It will take a couple minutes to start seeing data show up in the StacksWare dashboard but once the initial load of inventory data has completed, all subsequent changes will show up almost instantaneously. For example, I noticed that when I migrated a workload to another host or when I installed a new application, the StacksWare inventory was almost immediately updated on the SaaS portal. Once my lab inventory data became available, I noticed how simple everything was to understand when browsing the UI. This, in my opinion, is one of the most difficult things to achieve when developing a new solution. When you are able to mask complexity for ease of use and understanding this provides an extreme low time to value. Forrest stated this was one their first goals when developing StacksWare. When looking at use cases for StacksWare, a few come to mind when looking at such a product. I will focus on a couple of these use cases, where I immediately saw some of the obvious benefits in my own lab environment. 1) Notice how many instances of an application in this case “Java” are in use, along with the different Java versions. This example is showing my vCenter virtual machine where I had multiple versions of Java running with different users/accounts. 2) Determine what and how many applications are currently in use. Which applications are the most popular? How many different versions of the same software are installed? Which ones are the most popular? Do I have the correct number of licenses for the software? These are all questions that can be answered via the application asset dashboard along with corresponding executable mappings to the applications. 3) Easy visibility into when or where a virtual machine has been migrated from/to a host. If you want to have a dashboard of all historical Virtual Machine migrations this provides a nice glance of the vCenter migration data. 4) Audit application usage per user, even if using non-persistent VDI. For example, they claim to have the only tool on the market that can track what a user did in a non-persistent environment. Whether a user logouts or the virtual machine is recomposed, StacksWare captures application usage irrespective of the VM. I see this valuable to helpdesk, since they can can track user actions when a desktop or application crashes and hopefully diagnose symptoms that contributed. In this example, I can see which services and users have used or are using Java. 5) StacksWare implemented a novel way to provide help to their customers. They partnered and implemented Intercom into their StacksWare dashboard where instant communication can be provided to their customers. There are also helpful UI capabilities that allow for filtering or exporting the data for analysis. All in all, it’s a great start for quick and easy visibility into your virtualized applications. I can see how many could save resources on application licenses and application sprawl by having insight into usage patterns and/or application demands. Forrest tells me they will be at VMworld as a Silver sponsor this year, so make sure and add StacksWare to your list of places to visit this year! In the meantime, you can visit https://stacksware.com to sign up for a free demo and give it a try for yourself. This year I decided to make my first application into the VMworld Call for Papers. I have been wanting to do this for some time but my time and commitments never aligned. It's been a learning experience and so we will see how it goes! So, if you have find interest in learning more about migrating workloads to VVols and all the details that go with this, then please vote for this session. Careful planning is needed for successful workload migration to VVol based storage. Depending on the scenario and the datacenter environment it’s important to understand what is expected and required when migrating Virtual Machines in a mixed environment of VMFS and VVols. We will look at the steps and options available in a virtualized heterogeneous storage infrastructure, in addition to available VMware partner solutions. Since joining DataCore as Technology Evangelist, I have been hearing many in the community asking me, “What exactly is a Tech Evangelist?” “What does a Tech Evangelist do?” I know every company most likely has a tweak or difference in how they articulate a job description or title. However, I believe there are some commonalities, which I wish to address in today’s post. It is interesting that many people understand the word, “Evangelist,” to have some religious connection to it. That would be true, as I can attest to this first-hand, since my formative years were spent in a Pastor-Evangelist family. This led me later in my life to pursue a “Theology” degree where I was given additional exposure as to how an Evangelist communicates, listens, teaches, preaches, and relates in such a way as to inspire and influence the audience or Community. The word, Ευαγγελιστής, actually originated in ancient Greece prior to biblical times, where it was understood to mean a “reward given to a messenger for good news” or “bringer of good news.” Therefore, I can conclude the way “Evangelist” is used in the phrase “Technology Evangelist,” as laden with many values or connotations that I believe are necessary to bring about many positive benefits and results to a company wanting to educate its community. Another common belief that I have heard is that a Tech Evangelist is just someone in marketing. In my opinion for a Tech Evangelist to become a trusted advocate, he/she needs to have one foot in engineering and the other foot in marketing. This helps build a bridge where a deeper technical understanding of a product and/or service can properly be disseminated to the general public. However, this isn’t the only place where a Tech Evangelist roams. It’s common to see a Tech Evangelist support the goals and visioning found in Corporate, Support, Sales, Engineering, and Marketing departments. It’s important to understand and interface with each area and apply learning’s where the most help can be provided. I like “floater” as a term in which a good Evangelist is gifted with listening skills to internally and externally both gain and craft creative content, so as to tell the story most effectively. To be most successful, I believe that a Tech Evangelist needs to work in an organization, hierarchy, or department, that allows for flexibility of thought and experimentation, so as to test the best new ways to communicate the content or message. I also believe the core part of the role of a Tech Evangelist is not just educating or communicating to the public, customers, or clients, about a particular technology, but about building an army of believers. One person cannot have a big impact in building critical mass in the industry without an army of supporters all passionately preaching the same message. This is one reason why I think one typically observes startups hiring a Tech Evangelist, or even a large corporation hiring a Tech Evangelist to focus on one product or service in a myriad of products or features. There are many activities that a Tech Evangelist would be involved with; in fact others perform some of the same activities with different titles. The key is to explain how some form of tech works and why it matters rather than just describing a given feature. Below are just a few examples. If I missed any important areas that you think would add to this list, please feel free to comment or contact me. I am listing below in alphabetic order other noted Tech Evangelists who are focused in the Virtualization or Storage industry: If I have missed someone please let me know. I will add them to the list. I’m excited to officially announce that I joined DataCore Software as their Tech Evangelist! This is a position that I’m truly excited about as it aligns with my goals and aspirations while still engaging in technical conversations. I will be working alongside engineering and with many other great individuals at DataCore. I can’t wait to tell you about some of the hidden gems that I have found in my short time already! There is some great innovation happening at DataCore that I think will amaze many people. For those who are unfamiliar, DataCore provides software that abstracts storage and server data services. This abstraction provides enhanced performance, availability, storage management and much more. DataCore was the first to develop storage virtualization and has proven to be very successful. They have over 11,000 customers with over 30,000 deployments around the world. Currently DataCore’s SANsymphony-V software product line has seen 10 generations of innovations and hardening to make it truly enterprise worthy. There is so much to tell and so much in the works that I will have to save it for another time! Being a 300-page book that talks about the many architectural decisions when designing for storage performance, is not something for the faint of heart. The focus and desire was to articulate a deeper technical understanding of the software layers that intersect and interact with the differing hardware designs. I would like to thank Frank for giving me the opportunity to work with him on this project. It was truly a delight and a rewarding experience! You can directly download the book here. Enjoy! As you know we shipped PernixData FVP 3.0 version yesterday, but what you might not know is that we also shipped PernixData FVP Freedom Edition. This in my opinion is an exciting addition to the product family and based on the feedback we have already received it’s taking off in a major way!! Keep in mind this is totally free software with no restrictions or time limits. For those unfamiliar with the Freedom Edition I have outlined the supported features that come with this release. If you want DFTM-Z (Memory Compression) or the ability to configure Write Back for your virtual machines then you can easily upgrade to our standard and enterprise licensing options. We are launching with the Freedom edition a brand new community forum. This is to provide support and collaboration among the Freedom users. As you might guess, we are planning to add a lot of content over the next few weeks, so the more questions or interaction you have on the forum, the more it will make it useful for the Freedom community. In order to access this forum, you can visit https://community.pernixdata.com and click sign-in. We have enabled SSO support, so all you have to use is your same PernixData download portal account and we will redirect you back into the community forum. If you haven’t already requested the Freedom edition, you can request access here. Once registered you will automatically receive an email with instructions on how to gain access to the software and portal. This is totally an automated process, so you will get your Freedom license key the same day you request it!! I’m pleased to announce that PernixData FVP 3.0 has been released to the masses! This has been a combination of many long hours by our engineering and staff in order to reach this unprecedented milestone. Some of the highlighted features in this release are a result of a seasoned approach to solving storage performance problems while keeping a keen outlook toward what the future holds! In this post I will mention at a high-level what some of the new features are but look for more detailed posts coming soon. We now have support for vSphere 6.0 using FVP 3.0! If you are running a previous version of FVP, you will need to upgrade to this release in order to gain full vSphere 6 support. If you are in a process of migrating to vSphere 6, we now have support for a migration plan from previous versions of ESXi running FVP. For example, FVP will support mixed environments of vCenter 6.0 with hosts running ESXi 5.1 or newer. However keep in mind that FVP 3.0 will no longer be supporting vSphere 5.0 as a platform. FVP 3.0 offers a completely new user experience. FVP 3.0 introduces a brand new standalone webclient where you will be able to configure and monitor all your FVP clusters. In addition, the new standalone webclient now gives you visibility into other FVP clusters that may reside in a different vCenter or vSphere cluster!! This doesn’t mean you won’t have visibility in the vSphere webclient; we still have a plugin available that will give you the basic FVP analytics. However, all configurations and detailed analytics will only be available in the new standalone webclient. Some may ask why we built our own webclient which I think is a valid question. The truth is that in order for us to control the full user experience for FVP we had to grow our own while still supporting the vSphere client for those quick looksee’s. I think you will be pleasantly surprised how robust and extensible the new standalone webclient is. In addition to providing FVP actions and alarms through vCenter tasks/events, FVP 3.0 now has a separate audit log. This is where you can easily see all FVP related actions and alarms for a given FVP cluster. The part I like is the ease of just doing a quick review of what’s changed without having to visit each host in vCenter. The license activation process has been streamlined to offer greater simplicity and ease of use. You can now activate and manage all of your licensing online through the new PernixData UI. All you need is a license key while the new FVP licensing activation process will do the rest. You also have the ability to see more details on what is licensed and what isn’t in the new UI. In a world where speed is of the utmost importance, it has become apparent to me that there is a notion of relativity in latency. In other words, one needs a form of measurement - a time scale to understand how fast something really was and/or is. With high frequency low latency trading as depicted in this video, milliseconds is the name of the game. A loss of 2 seconds, as an example, can be a matter of losing millions of dollars or prevention of a catastrophic financial event. In using this example, how can one feel what 2 milliseconds feels like? Can one tell the difference between 2 or 3 milliseconds? I find it fascinating that we as humans sometimes base what is fast or slow on what it feels like. In fact, how do you measure a feeling anyway? We usually have to compare (base line) to determine if something is really faster or slower. I would argue that it’s sometimes the results or effect of latency that we measure against. In low latency trading, the effect or result can be devastating, and so there is a known threshold to not go past. However, this threshold is constantly being lowered or being challenged via competitive pressure. This means it’s important to constantly have latency references to measure against in order to determine if the combined effect will have positive or negative results. This is why testing synthetic workloads (in order to determine what the performance is) can result in inaccuracies of what is truly fast or slow. When one tests only one workload, it’s not depicting the combined effect of all disparate workloads and their interactions as a whole. Another inaccurate way to measure is to base decisions solely on what the end users feel is faster or slower. I know it can be interesting to see what the end-user thinks, but it’s not an accurate way to look at the whole system, as a way to measure. The results seen for all work done (may be based on a project) is a better way to measure the effect. This can obviously complicate the process of measuring, but there are places to focus that will give a more accurate look on latency effects as a whole if one follows what I call the time scale reference. Contrasting what we deem fast historically and what is on the horizon is not just interesting but important for baselines. Proper latency measurements become important milestones to feel the full effect of speed and acceleration. Let’s say for example you had to take a trip from Atlanta, GA to San Francisco, CA in a truck carrying peaches. You had two routes to choose from. One would take 3 days and the other route would take 6 months. Now, if you wanted to take the scenic route, and you had tons of time, without the peaches, you might want to take the longer route. However, if you took 6 months, those peaches would smell quite bad by the time you got to San Francisco!! Using real world analogies like this on a time scale that we can decipher is important in order to see the differences and the effect it may have. Now why did I choose 3 days vs. 6 months for this example? A typical Solid State Disk has an average latency around 100 microseconds. Compare that to a rotational standard hard drive at about 5 milliseconds. If I scale these as to compare how drastic the time difference is between the two, it’s 3 days for the SSD and 6 months for the standard hard drive. Now, I can really see and feel the variance between these two mediums, and why a simple choice like this can make a gigantic difference in the outcome. Let’s now take it up to another level. What if we now had the capability to travel with our truckload of peaches to San Francisco in 6 minutes instead of 3 days or better yet how about 40 seconds? Today 6 minutes is possible as it applies to standard DRAM, but 40 seconds isn’t too far off, as this is representative of the Intel and Micron announcement for 3DXPoint NAND. If I take these latency numbers and plug them into my datacenter, then I can start to see how simple choices can really have a negative or positive impact. You may now be saying to yourself, “Well if I go with SSD’s today, then tomorrow I basically need to rip and replace my entire stack to take advantage of the newer thresholds of latency, like the new 3DXPoint NAND, or even whatever is next! !” The exciting part is that you don’t have to replace your entire stack to take advantage of the latest and greatest. Your truck carrying those peaches just needs a turbo boost applied to the engine. You don’t need to buy a new truck, which is why choosing the proper platform becomes very important. Choosing the right truck the first time doesn’t tie your hands with vendor lock-in when it comes to performance. In conclusion, I hope that one can now understand why proper base lines need to be established, and real world measurements need to be referenced. It’s not just a feeling of what is faster. We now are past the point of recognizing the true speed of something as a feeling. It’s the cause and effect or result that determines the effective threshold. Then tomorrow the threshold could lower with new innovations, which is all the more reason to have a time scale of reference. Without a reference point people become accustomed to the world around them, missing out on what it really is like to travel from Atlanta to San Francisco in 40 seconds or less. Don’t miss out on the latency innovations of today and tomorrow; choose your platform wisely!